Briggs Farm is located at 27171 County Highway 9, Winona, MN. Please be aware that some GPS and mapping services incorrectly point you to an address south of I-90, near Houston. You want 27171 County Highway 9 north of I-90. You can also search for Cedar Valley Lutheran Church; our property is adjacent. Via Hwy 61: Go south on Highway 61 to County Highway 9; there will be a green highway sign indicating County Highway 9 and a right turn lane. Turn right. (The Mississippi River is on the left, so it’s your only option.) Take County Highway 9 about 6 miles to Briggs Farm. Along the way, you will pass Cedar Valley Golf Course; we’re approximately three miles beyond that. You’ll see Cedar Valley Lutheran Church (the pretty white church with the spire), then the road will turn to gravel, and a quarter mile after that, you’ll see the entrance to the farm. Via Witoka: Many mapping and GPS services will suggest taking Pleasant Valley Road to Witoka to catch County Highway 9. 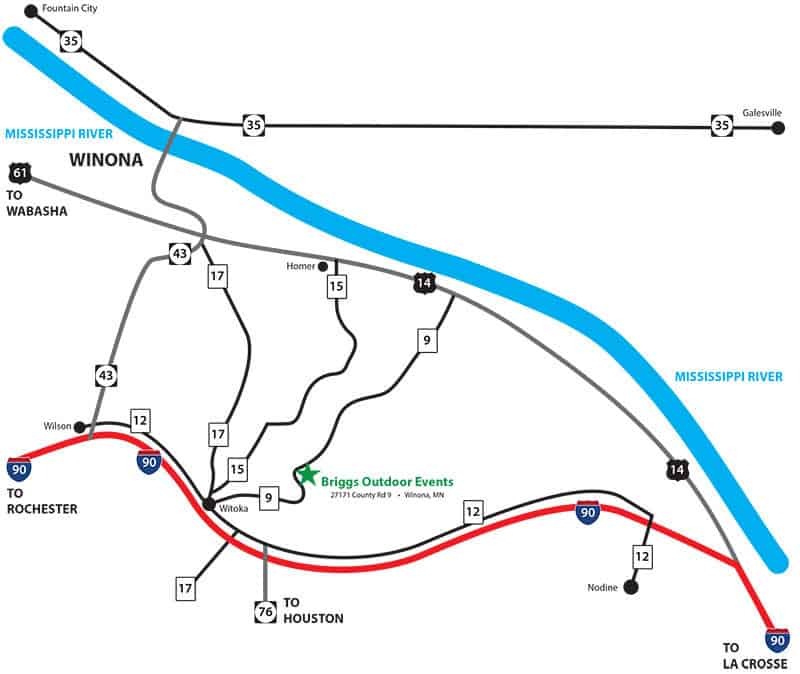 This route will get you there easily enough (Witoka is tiny, so you can’t miss the turnoff), but be aware that it involves three miles of (very good) gravel road, as opposed to a quarter mile if you go the slightly longer route via Hwy. 61. From Rochester: Take Exit 258 (marked for Houston). Turn left at thge top of the exit to cross over I-90, then turn left on County Road 12. Take County Road 12 about 1.7 miles to County Road 9 in Witoka. Turn onto County Road 9, which will quickly become a good-quality gravel road (smooth, flat, and wide enough for two lanes). The farm is 3.2 miles down the road, on your left. If you see Cedar Valley Lutheran Church or the road turns to asphalt, you’ve gone too far. From La Crosse: Take Exit 257 (marked for Houston). Turn right at the top of the exit, then turn left on County Road 12. Take County Road 12 about 1.7 miles to County Road 9 in Witoka. Turn onto County Road 9, which will quickly become a good-quality gravel road (smooth, flat, and wide enough for two lanes). The farm is 3.2 miles down the road, on your left. If you see Cedar Valley Lutheran Church or the road turns to asphalt, you’ve gone too far.